Restatement of the Law of Trusts aims to organize and explain the principles in the field of trusts. 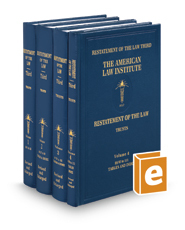 The work offers guidance to trustees, lawyers, and judges by explaining and illustrating the governing rules and discussing relevant cases, statutes, and secondary sources. Commentary provides a scholarly and analytical discussion of particular rules, and general rules are clearly and concisely stated for easy reference. Other editorial features include an appendix containing citations and summaries of cases that have been decided with the help of the Restatements.